A federal judge says a family living inside Montana's Glacier National Park can no longer use a snowmobile to access their property. Former Denver residents Jack and Stephanie McFarland sued Interior Secretary Bruce Babbitt in Missoula's U.S. District Court on Feb. 2. The McFarlands said park officials had acted improperly when they refused to issue the family a special permit so they could snowmobile in to their property. The lawsuit also accused the National Park Service of an "unconstitutional takings' of property. The McFarlands maintain they have special privileges as "inholders," and that the government can't restrict reasonable access to their 2.75-acre tract along the North Fork of the Flathead River near Polebridge. The McFarlands and their three young children moved to a cabin on the property last May. At the time, park officials say they warned the couple that the access road would be closed to vehicles once winter set in. Snowmobiles have been banned in Glacier Park since 1975. Jack McFarland, 40, a financial consultant and World Wide Web page designer, commutes frequently to New York City. Once the road became snowbound, the family began skiing and hauling sleds to and from their property. Park officials said the couple could keep a snowmobile at their cabin, but only for medical emergencies. Then the family went to court. Federal Judge Donald Molloy first granted the family's request for a temporary restraining order against the park. That allowed the McFarlands to use a snow machine for all types of transport. But on Feb. 8, Molloy refused to issue an injunction that would allow non-emergency snowmobile use to continue. 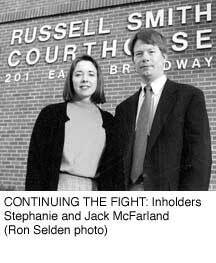 The McFarlands argue they've had family ties to the inholding for decades. They say the government now restricting their access created the problem by inviting homesteaders to settle the area before it became a national park. They vow to keep their lawsuit alive. "The federal government encouraged these people to come," Stephen Berg, the family's attorney, told Judge Molloy. "You can't invite them in and gradually exclude them from getting to their property year-round." "It wasn't simply that the park suddenly woke up and said there's not going to be any snowmobiles here," Molloy responded. "(Jack McFarland) created the situation that he's now arguing creates a risk to him and his family."